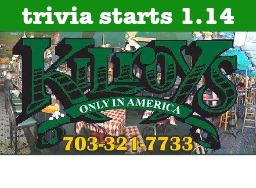 Trivia tonight (1.14) begins at Kilroys! The venue is a neighborhood staple and friendly staff will make you and your trivia team feel right at home. The game begins at 7:30pm - gather your team and start qualifying for the $5000 Tournament of Champions grand prize!